Platinum Games producer tweets Bayonetta tease with words. Subtlety makes nice change. Sometimes, Google Translate just doesn’t do the job. I shove a tweet in, and I get some rubbish about ‘Veyo’ out. Luckily the good folks at Andriasang.com happened to translate just this particular tweet which painted the red facepalm of epiphany across my face. Good morning. 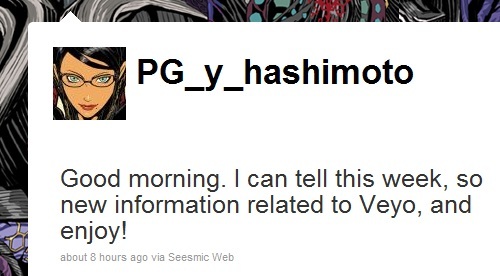 It looks like we’ll be able to share new information related to Bayonetta this week. Look forward to it. Not ‘Veyo’, it was ‘Bayo’! Oh how whimsical. Of course more importantly, seeing as Bayonetta is already out, this could be an incredibly exciting pre-annoucement to a Bayonetta sequel or spin-off. Or DLC. Or, well anything really. But if’s related to Bayonetta you can be sure we’ll be keeping our eyes open. With Vanquish arriving in this year, it’s about time we heard about a new project after all. NPR: Why do girl gamers get so little respect? I really hope to see a Bayonetta sequel announced. It’s probably one of Sega’s most successful new franchises and I loved the first game. I’d really like to see a new one. I’d love to see that too, though I have a nagging feeling that it’s DLC. Feels a bit unceremonious for a sequel announcement. Interesting experiment with Google translate. In Japanese ? ?can be read as either “Be” (Pronounced “Bay”) or “Ve” (“Vay”). Makes sense that Google can’t distinguish between the two. That’s why they always made that weird sound in Daytona USA when the voice was spelling out “gameover.” When he got to “V” it sounded weird. Kinda like “vu” or something.